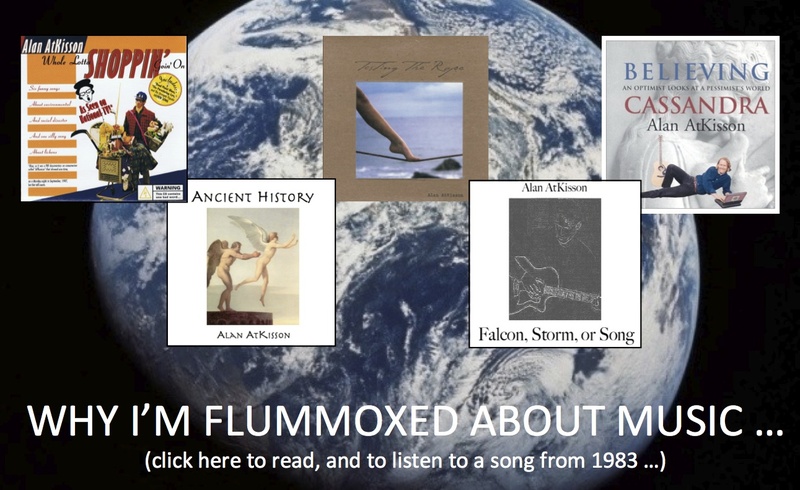 Update 12 Apr 2013: I wrote this about six months ago, but now, I am no longer feeling so “flummoxed.” The musical path forward is getting much clear. See What Music Means (to Me). I confess: I am flummoxed. (Translation: deeply puzzled about what to do.) Why? Because I don’t know how to reach my audience. I’m a family man, and a working sustainability consultant, and those are my highest priorities, in that order. But I’m also a writer, a poet, a songwriter, a musician. I don’t have the time (or the energy, or the drive for attention) required to run around tooting my horn and selling my creative products. But this world doesn’t notice you if you don’t. So why am I making a new album, full of new songs? And what should I do with my old ones? Maybe I’m fooling myself, but I imagine that my potential audience is somewhat bigger than the Twitter followers (833) and the Facebook friends (642 “friends” + 318 “likes” on my public page). Or the average 500 per month who visit my blog. Or the 500 or so who actually open my company newsletter (out of 2,700 on the list). In fact, I am pretty sure my audience used to be bigger, back in the good old pre-Twitter days. My first book sold something close to 20,000 copies. My essays on the now-defunct blog Worldchanging were probably read by many more, and occasionally got noticed by the news media. My music … well, to be honest (with myself), not that many people know my music. My greatest “hit” is a YouTube video (my song “System Zoo”) that has been watched 7,757 times. Yes, my albums are available on iTunes and Amazon … and I have sold a whopping 107 songs and six albums through those channels, generating $118. That doesn’t much bother me. I write songs because it pleases me to write them, and play them, and record them, and occasionally even listen to them. If no one else ever listens to them … well, that’s fine. Like any artist, I would certainly prefer that other people listen to my songs, read my books, etc. But — again — I deeply dislike tooting my own horn and doing self-promotion. And the older I get, the less energy I’m willing to spend on self-promotional activity. Hence I am flummoxed. When I made Whitewing, I was just starting to dream of a career in music. A few years (and a few bands) later, I was finally offered the management contract of my dreams … and I turned it down. Cut my hair. Changed careers. Headed toward what we now call sustainability. The reality of succeeding in a career in music — endless touring, smoky bars, playing the same repertoire every night for months — was, when I finally looked that possibility in the face, far less appealing than the dream. And yet, today I go into the studio again. I’m in the process of recording my sixth album — after a break of twelve years. You probably never heard of most of my albums — “Fire in the Night,” “Testing the Rope,” or the twelve Rilke poems I set to music on “Falcon, Storm, or Song.” (I recorded that one in the year 2000, but did not release it until 2006.) Three of them — the Rilke album, plus the humor album “Whole Lotta Shoppin’ Goin’ On,” and the more serious singer-songwriter collection “Testing the Rope” — are available on Tunecore. This new album is a return to the troubadour-style ballads of “Testing the Rope.” In fact, I’m thinking of calling the album “American Troubadour,” which is one of the song titles, and also a good description of how I feel these days in relation to music: American. 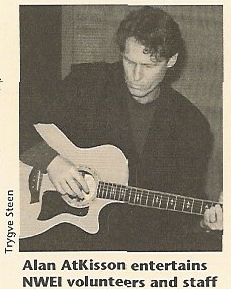 You see, living in Sweden — which has a long troubadour tradition, yet not a lot of places for troubadours to play, and even less opportunity for 52-year-old, family-man, American-origin troubadours to play — has further complexified my situation, and made the whole music thing an even more private affair. On top of that, Sweden is not a country where you stand up and say, “Oh, by the way, I’m not just this, I’m also that, and I’m actually this other thing as well, and please listen to my songs and read my books.” Sweden feeds my natural inclination to not draw attention to myself, even though I am in a profession — author, speaker, performer, etc. — that requires drawing attention to oneself. Then there’s the issue of mixing your professional identity (which I’ve written about in my books). 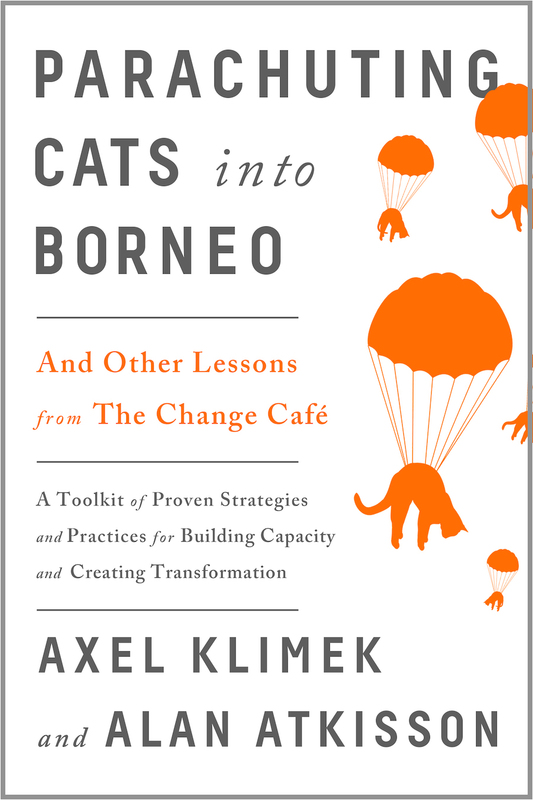 I do quite a lot of work that falls into a category that one might call “serious” — advising companies or UN agencies, writing reports on global economic issues, moderating high-level panel discussions, etc. But my best-known songs (as anyone reading this probably knows) are humorous. Singing humorous songs, especially live, puts one automatically in a sort of “clown-entertainer” role. “Serious” work and “clown” work do not mix together very well. Flummoxed or not, I’m going to keep doing what I do. Maybe more so. All of it. Including music. I’m going to start putting more of that music here, on my blog, so you can access it (for free). And I’m making a new album. (It’s not a funny one.) I have no idea how I’m going to promote that album, or even pay for it — but there’s a decade worth of songs that are just demanding to be recorded. They won’t let me alone until I do. And then … I’ll put the work out there. On Facebook, Twitter, the Blog, the Amazon, whatever channels are available.